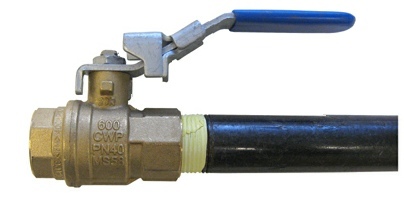 If you are connecting the Torch Booster to a pipe manifold put a B to NPT adapter on the end of the flashback arrestor check valve for connection to a pipe going to multiple torches (see photo). This is a general description of how to install G-TECTorch Boosters - please read the User’s Installation and Information Manual that is included with with your Torch Booster for complete installation details. 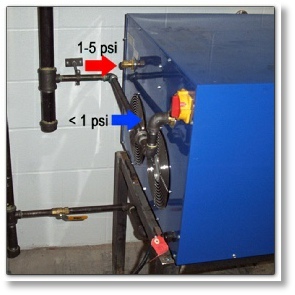 After the shutoff valve is connected to the supply pipe screw the adapter fitting into the ball valve. Be sure to use sealant tape for this fitting and tighten the adapter with a 7/8” open ended wrench. 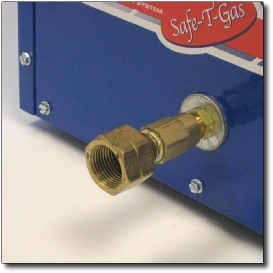 If you already own a regulator with a CGA 510 fitting (this is the same fitting that screws into a propane BBQ tank) then you can use it with your Torch Booster. 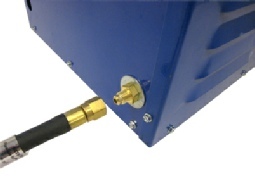 Your system includes a female CGA 510 fitting and adapter for connection to the Torch Booster. 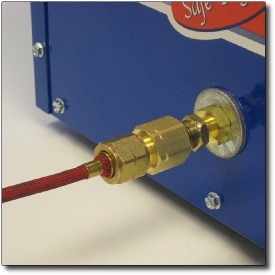 Be sure to install a “Regulator Mount” flashback arrestor on the regulator, or a “Torch Mount” flashback arrestor on your torch. 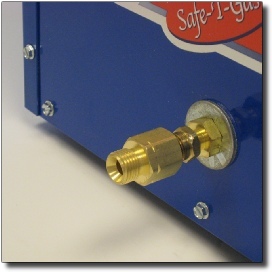 If you use a regulator like the one in the photo put something under the regulator body to support it’s weight. 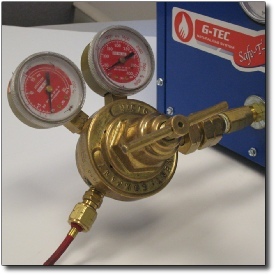 G-TEC includes a 1/2” shutoff valve with TB-15/30 and a 3/4” shutoff valve with TB-60/125. 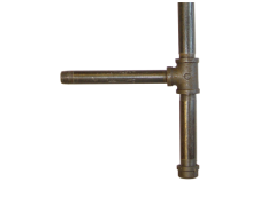 Apply Teflon sealant tape to the thread on the male pipe end then tightly screw the shutoff valve onto the pipe. NOTICE: If your Torch Booster makes a rapid clicking sound when starting STOP IMMEDIATELY AND CALL G-TEC AT 1-800-451-8294. A simple adjustment that is done with a screwdriver is needed but continuing to try to start the Booster can damage a $ 300 part. We will explain how to make the adjustment when you call.